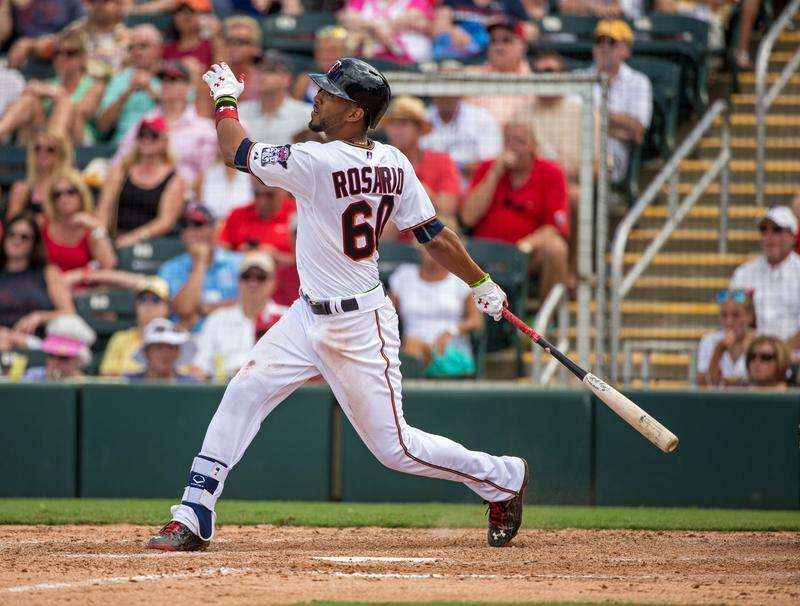 Last week, when the Twins needed a fill-in for the injured Oswaldo Arcia, they bypassed Aaron Hicks in favor of Eddie Rosario despite the latter's struggles dating back to last year and vastly inferior Triple-A production in the same Rochester outfield. Now with Shane Robinson having a family emergency the Twins have called up Hicks, who hit .336 with a .415 on-base percentage and .561 slugging percentage in 27 games at Triple-A to lead the International League in OPS. 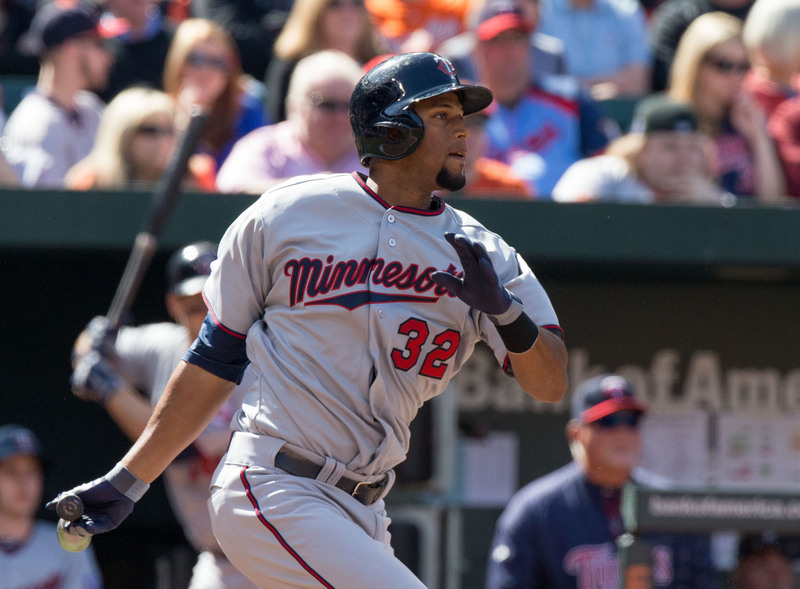 In both 2013 and 2014 the Twins handed Hicks the Opening Day center field job and he flopped. This time around the deck was stacked against him getting a third crack at the gig. During spring training the prospect getting all the hype was Rosario, not Hicks, and the Twins eventually settled on splitting center field duties between the journeyman duo of Jordan Schafer, a 28-year-old waiver wire claim, and Robinson, a 30-year-old minor-league signing. It hasn't worked out well, predictably. Robinson has done a quality job in a limited role, playing good defense and hitting some singles while facing mostly left-handed pitching. Schafer has come back down to earth after a good 46-game showing with the Twins last season that stood out from the rest of his sub par track record. Combined the Twins' center fielders have hit .257 with a .284 on-base percentage and .289 slugging percentage in 32 games. As bad as Hicks has been in the majors his career on-base percentage and slugging percentage for the Twins are both higher than the Schafer/Robinson duo has produced in center field this season. He also has significantly more upside than Schafer or Robinson, although certainly far less so than the Twins hoped when they had him jump from Double-A to the majors as a 23-year-old in 2013. However, at age 25 and after crushing Triple-A pitching he deserves another opportunity. Hicks is only one year older than the Twins' "young" trio of Arcia, Danny Santana, and Kennys Vargas. He's already shown the ability to be an asset against left-handed pitchers, posting a solid .750 OPS off them for the Twins in 2013/2014. Within his overall struggles last season Hicks drew lots of walks on the way to a .341 on-base percentage in 69 games. And in addition to thriving at Triple-A this season he hit .291/.387/.441 in 67 games at Double-A and Triple-A last season. It's not a mystery why the Twins were hesitant to give Hicks another chance. He hasn't hit right-handed pitchers, his defense in center field has been very shaky, and the team publicly called into question his work ethic and instincts. Those are facts and I'm not writing this from the perspective of a huge Hicks believer. Even when he was a top prospect I was never particularly high on him, although obviously I expected him to perform a lot better than he has so far. However, when a 25-year-old former top prospect two seasons removed from being rushed into an Opening Day job shows signs of progress giving him another--and perhaps a final--shot makes sense. At his worst, which is what we've seen so far, Hicks is still as good as the Schafer/Robinson duo. At his best, which is mostly hypothetical, Hicks still has the potential to be a useful regular. Of course, it may be a moot point if Hicks' stay only lasts until Robinson returns in a few days. For a lot more about the Twins' roster decisions and surprising, emphatic climb above .500 check out this week's "Gleeman and The Geek" episode. It's common for the Twins to cite a prospect's lack of "consistency" in the minors as an excuse for why they haven't been called up. Most recently they did so with Triple-A reliever Lester Oliveros, who has a 1.65 ERA and 109 strikeouts in 76 innings since last season. Sustained dominance like that makes the notion of Oliveros lacking "consistency" seem absurd, particularly compared to the low standards for "consistency" the Twins so often seem to have for mediocre veterans. Another problem with the Twins citing a lack of "consistency" whenever it suits them is that when it doesn't suit them they're quick to ignore the concept. Right now, for instance. Needing outfield help with Oswaldo Arcia headed to the disabled list with a hip injury, the Twins called up Eddie Rosario from Triple-A to make his MLB debut at age 23. Rosario was hitting .242/.280/.379 with a 17/5 K/BB ratio in 23 games for Rochester, which is terrible. And that's nearly identical to his terrible performance last year, when Rosario was suspended for the first 50 games following a positive drug test and returned to hit .237/.277/.396 with a 68/17 K/BB ratio in 79 games at Double-A. 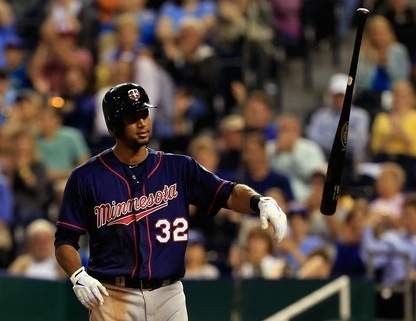 In between he was talked up by the Twins throughout spring training only to hit .233 with zero walks in 17 games. In retrospect the spring disconnect between the praise he received and his performance was foreshadowing. Rosario was suspended 50 games for drug use and hit terribly at two levels of the minors and in spring training since returning, but "consistency" apparently isn't always a must for a call-up. For whatever reason the Twins and especially manager Paul Molitor are infatuated with Rosario and it's also clear they've totally soured on Aaron Hicks, himself a former top prospect who struggled in the majors after being handed an Opening Day job too soon and is still just 25 years old. Hicks is hitting .289/.375/.494 with a 15/12 K/BB ratio in the same Rochester lineup as Rosario, topping him in every way except being on the Twins' good side. Hicks also hit .291/.387/.441 with a 40/37 K/BB ratio in 67 games between AA/AAA last season, easily out-performing Rosario again. And while Hicks has struggled for the Twins, he posted a .341 on-base percentage over 69 games in the majors last year while Rosario has failed to crack a .300 OBP in the minors since last year. Hicks is also considered as good or better defensively than Rosario, who attempted to transition from center field to second base before going back to the outfield full time this season and has always been projected more as a corner outfielder due to limited range. It's hard to blame the Twins too much if they've indeed given up on Hicks, but there's no indication Rosario is ready for the majors and this move makes any "consistency" talk look even sillier than usual. As for Arcia, this is another setback on his quest to gain the Twins' trust and establish himself as an everyday, middle-of-the-order bat. Molitor's willingness to platoon has put Arcia on the bench frequently versus lefties and both his plate discipline and defense remain huge weaknesses. He's hitting reasonably well at .276/.338/.379 in 19 games, but all four of Arcia's walks have been intentional and he's swung at the second-most pitches outside the strike zone in the league. For a lot more about the Twins' recent roster moves and call-up timetables, check out this week's "Gleeman and The Geek" episode. Also in this series: 11-15, 16-20, 21-25, 26-30, 31-35, 36-40. As a college starter with three seasons of major conference experience LSU right-hander Ryan Eades was a prototypical Twins target in the second round of June's draft and he's the eighth college pitcher they've selected with a top-50 pick since 2005. Eades missed his senior season of high school following shoulder surgery, but was injury free at LSU and led the team in starts last season. However, fading down the stretch in 2012 and 2013 put his durability in some question and Eades struggled in his pro debut with 12 walks in 16 innings at rookie-ball. Even after a late-season fade Eades finished with a 2.81 ERA for one of the country's best college teams, but a .269 opponents' batting average and 77 strikeouts in 96 innings were underwhelming. And that modest strikeout rate is actually an improvement over 2012, when Eades struck out just 63 in 94 innings. Combined during his final two years Eades averaged 6.6 strikeouts per nine innings, which paled in comparison to LSU's aces Kevin Gausman and Aaron Nola. Eades obviously isn't on the same level as Gausman and Nola or he wouldn't have been available at No. 43, but the point is that his raw stuff has yet to turn into strikeouts. With that said, it's good raw stuff. Baseball America rated him 37th in the draft class, noting that Eades "looks the part of a frontline starter." 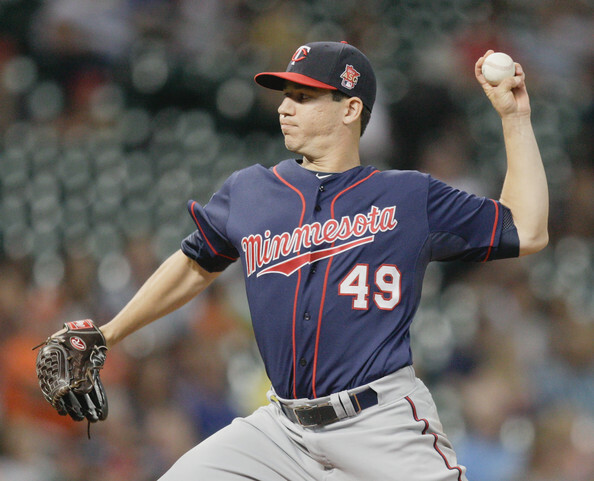 Acquired from the Phillies last winter in the Ben Revere trade, Trevor May repeated Double-A as a 23-year-old and showed little improvement across the board. He posted a 4.51 ERA compared to the Eastern League average of 4.01, cut his walk rate only marginally to a still-awful 4.0 per nine innings, and induced fewer ground balls than his first go-around to signal that a dip in home runs allowed may not be as encouraging as it first appears. The good news is that the 6-foot-5 right-hander still throws very hard and still misses plenty of bats, striking out 9.4 per nine innings after whiffing 9.1 per nine innings in 2012. Those strikeout rates are good rather than great and can't compare to May's eye-popping strikeout totals in the low minors, but clearly the former fourth-round pick still has some upside. However, he's no longer considered a high-end prospect after cracking Baseball America's top-100 list for 2012. At the time of the trade there were rumblings about May being destined for relief work long term and the lack of progress he's made, particularly with his control, have raised the volume on those concerns. He likely needs to show considerable progress at Triple-A this year or risk being shifted to the bullpen, although certainly May could eventually still make a big impact as a late-inning reliever with a mid-90s fastball. Signed out of the Dominican Republic for $775,000 as a 16-year-old the same year the Twins added Miguel Sano and Max Kepler as big-dollar international prospects, Jorge Polanco has likely outgrown shortstop and become a good defensive second baseman with a potentially very strong bat for the position. Polanco showed a ton of improvement at rookie-ball in 2012 and then transitioned to full-season competition last year by thriving at low Single-A as a 19-year-old. Polanco hit .308 with just 59 strikeouts in 523 plate appearances, drew a decent number of walks, and smacked 47 extra-base hits, all while being one of only nine teenagers in the entire Midwest League to play at least 100 games. As a switch-hitter he fared equally well versus righties and lefties while posting an OPS above .765 in all five months of the season and managers voted him the best defensive second baseman in the league. He'll likely play most and perhaps all of this season as a 20-year-old at high Single-A. To put that in some context, consider that no one under 21 logged 500 plate appearances in the Florida State League last season and only three logged more than 400. Simply holding his own in the FSL would be an accomplishment and if Polanco produces in 2014 like he did in 2013 he'll be near the top of this list next spring. Well, we know Josmil Pinto can hit. Last season he followed up a strong 2012 between high Single-A and Double-A by hitting .308/.411/.482 with nearly as many walks as strikeouts in 107 games at Double-A, batting .314 with 10 extra-base hits in a 19-game Triple-A stint, and making his Twins debut by hitting .342/.398/.566 in 21 games as a September call-up. Add it all up and Pinto batted .314 with 19 homers, 37 doubles, and 72 walks in 147 games as a 24-year-old. And yet there are questions about how he fits into the long-term plans because his defense behind the plate has always received mixed reviews and the Twins thought so little of his ability to catch in the majors this season that they signed Kurt Suzuki to be the starter despite his not cracking a .700 OPS since 2009. As a poor but passable catcher Pinto has enough bat to be an impact player, but as a designated hitter his bat would be nothing special unless he adds more power. Last season MLB catchers hit .245/.310/.388 for a .688 OPS that was the second-worst from any position behind only shortstop. By comparison DHs posted a .725 OPS that was either ahead or within 10 points of every position except first base and right field. Beyond that, on the Twins his long-term path would be relatively clear at catcher, whereas there are always plenty of DH options and specifically Miguel Sano or Oswaldo Arcia may wind up as preferred choices there. Eddie Rosario had a very nice 2013, beginning the year by crushing high Single-A pitching and finishing it by holding his own at Double-A as a 21-year-old, but then he began 2014 by receiving a 50-game suspension for a "drug of abuse." Under the terms of the minor league drug agreement that means he previously tested positive without getting a suspension and then continued to use the drug, which is perhaps more troubling behavior than the drug use itself. On the field Rosario did what he's done since the Twins made him their fourth-round draft pick out of Puerto Rico in 2010, hitting for a high batting average with gap power and poor plate discipline. He also spent the entire season at second base after beginning the transition from outfielder to infielder in 2012, but there are questions about his ability to be a serviceable defender there in the majors and his offensive skill set would look somewhat marginal for a corner outfielder. Rosario is a career .307 hitter, including at least .290 in all four seasons, but he's totaled just 22 homers in 217 games above rookie-ball while walking just 69 times compared to 165 strikeouts. That includes a 67/21 K/BB ratio in 70 games at Double-A, although in fairness he was one of only nine 21-and-under hitters in the Eastern League. Still, it doesn't look like he'll produce a ton of homers or walks, which is a profile that typically doesn't equal a big impact in an outfield corner.